This is how it looked on an overcast day. You may not know you have, but you have definitely seen them. It’s not possible you have lived this long without seeing some version of water lilies painted by Claude Monet. He produced something like 250 paintings of nymphéas, as they are known in French, and these works can be found in museums from Tokyo to Toledo. They also appear on towels and calendars and keychains and cocktail napkins. Monet’s water lilies may not be as instantly recognizable as the “Mona Lisa” or Michelangelo’s “David”, but I’d guess they are almost as widely reproduced. The models for all those paintings were in a pond on Monet’s property at Giverny, a village about 50 miles west of Paris. He and his wife and kids lived in a rented house there beginning in 1883; his increasing wealth enabled him to buy the house in 1890, when he soon began improving the grounds. Monet read up on plants and designed an expansive garden. There is a Japanese bridge in it — you’ve seen those paintings, too (for a reminder, squint at photo above). Then there’s the pond that is home to the water lilies, which are probably the best known of Monet’s “series paintings”. He’d had the inspiration to paint the same subject at different times of day and with different points of view. The west facade of Rouen Cathedral was thoroughly explored in one series, and haystacks in the countryside near Giverny got a similar treatment. According to art historian H.H. Arnason, Monet’s approach was “an attempt to capture the ephemeral aspects of a changing moment.” In a way, it was like painting time-lapse pictures — each canvas was sort of a still-frame from a movie (or I guess nowadays we’d call it a “vidcap”). Especially in the last years of his life, Monet’s garden was his subject matter. He’d walk out of his house, set up his easel and start painting what he saw: the garden, the bridge, the pond with its water lilies. If you’re a fan of his work, Giverny might be a pilgrimage site for you, because Monet’s house and garden are still there. They are diligently maintained by a staff that follows the instructions Monet wrote for his gardeners a hundred years ago. It’s an easy side trip from Paris: Catch a train at Gare St-Lazare, a station that Monet painted on several occasions. It takes less than an hour to get to the town of Vernon; from the train station in Vernon, there’s a bus that will take you the 4 miles to Giverny. None of Monet’s original paintings are in the house, but if you’re still wondering what his paintings of water lilies look like, try the gift shop, or anyplace around the village. Trust me, it’s about as hard as trying to find baseball-related souvenirs in Cooperstown, where baseball’s Hall of Fame is located. If you can’t find a Monet reproduced on a coffee mug or an apron or something here… well, just hold out a handful of Euros and it will find you. This entry was posted in Art, Travel and tagged Claude Monet, Giverny, series paintings. Bookmark the permalink. Oh my gosh that is spectacular! Such amazing artistry he produced. Monet is a passion. Usually just like living through your adventures- but catching the train at St Lazare, that I would love to do. FYI, click on the picture and it will enlarge to such a degree that you can see the toll basket on the left side of the bridge. Having been to Cooperstown many times, I know that Abner Doubleday did invent…Claude Monet. Hmm. Somehow I missed that bit of baseball lore. I read recently that his style changed as his cataracts grew worse. Amazing to paint despite visual impediments! You’re right — his cataracts not only blurred his vision, they impacted the way he perceived color. For instance, the Minneapolis Institute of Art has a painting of the Japanese Bridge that is mostly done in hues of red and orange. In 1923, he did have surgery, but only on one eye. The resulting difference between left and right eyes probably made painting even more challenging for Monet. 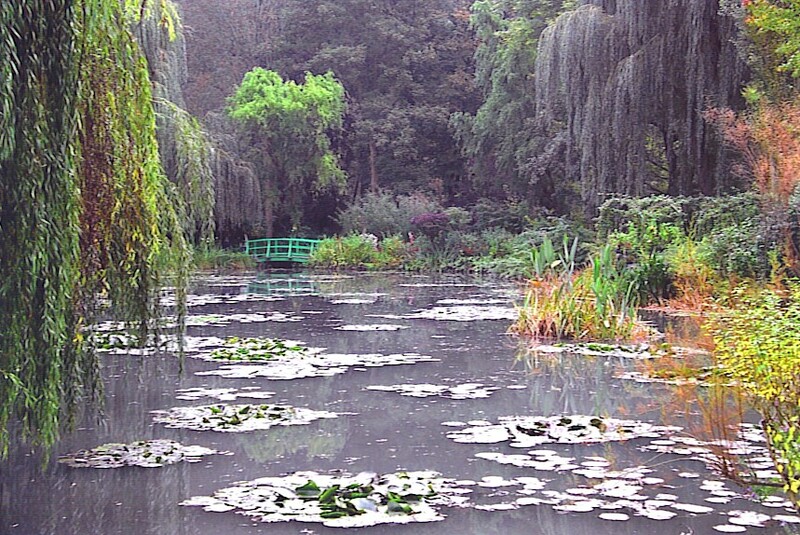 Or if you are on this side of the ocean, a visit to NYBG for Monet’s garden might suffice until you can see Giverny!